Marylegs very 1st British Novice class at Warren Farm excelling herself with a double clear and a fourth place! Well done Marylegs and here’s to many more double clears. Marylegs has had a fab week this week it started on Sunday with a trip to the beach. She had a great time. This time she didn’t have the scary (very) presence of Murphy (the Stallion) so even enjoyed the journey! This time she went with Hero which was far more pleasant – but she is still the fastest horse on the yard – he couldn’t catch her for toffee! 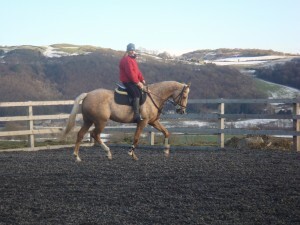 On Monday she went up into the school and was lunged than ridden. We are working on her bending which is a little ropey at times but she is getting there. On Tuesday she went out for a hack up the fell taking in the picturesque views around Lowick. On Wednesday it was jumping day! She did fab and even managed to stop after the jumps! Yesterday was her day off she went up to the school for a run and a roll and then spent the rest of the day sleeping bless her! So far this week Marylegs has been lunged and ridden every day in a bid to compete in British Novice and Newcomers successfully. She is doing well and just needs to RELAX. She hasn’t been put off by the ice covered hillside, the diggers at work and the frosty schooland has been trooping on. She is a bit on the cross side that she hasn’t been turned out and will not stop wanting to fight with Hero (her box neighbour). Cantering has been a no go area this week as the school is a bit to hard at the moment (roll on Spring) but her trotting was lovely. Check out the Blue sky! I can’t be sure about this White Stuff! Last week we have had way too much snow for my (and Marylegs’ liking) on Tuesday after 2 days inside (which is just boring) the ground was crunchy enough for them to have a wander outside for a couple of hours. Wrapped up toasty warm (with their jama’s under their jackets) Marylegs was asked to venture for a frolic in the eskimo way. but she thought better of it. Being the big wuss that she sometimes pretends she can be she was not for setting foot in the snow and i struggled to get her out of her bed! However, after a good 5 seconds of encouragement (which is about how long it usually takes to encourage her to do anything she doesn’t want to) out we went. Once she got over the initial shock she loved it and couldn’t wait to get out the next day! 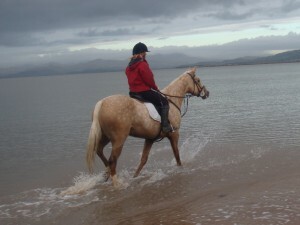 Not to be left behind on Friday Marylegs, along with Murphy and another Pony Leo went to the beach. Marylegs was a little uncertain about the beach (as often Marylegs is) and this time was particularly bothered about getting in the wagon with the stallion (who can blame her). However, she rose to the occasion and going via Caterkwik to pick up her rider Faye, she arrived relatively calm. She was very unsure about the squelchiness of the sand and spent some of her time getting on the beach backing up into the sand dunes which was particularly funny as getting up there was never going to be as much hard work as getting down! But in true Marylegs lets-fight-it-together style she made it down and was first into the water – what a star! It must also be said that as the opportunity arose for a galllop Marylegs is definitely the fastest Horse on the yard! It has finally stopped raining in Lowick! Today has been a beautiful (if not a bit on the nippy side) day and Marylegs finally got to go for a nice leisurely hack without being hailstoned on! She was so pleased with the weather, as was Faye and went on a long ride taking in the scenery of Blawith. She was impeccably behaved as always and is now having to sleep it off in her box! Today Marylegs is enjoying her day off. Due to having a cut on her leg she doesn’t want to be standing around in the (inevitably) muddy fields and so has just been out for a little strut! Due to the arctic – like conditions up here in Lowick we put on her jacket and wandered up the road, enjoying the views (mainly sheep and some very funny little cows) and sampling many, many patches off grass. It was just enough for her to stretch her legs and then go back to her favourite place – bed!